Ever since I was a kid I have wanted to see the Komodo Dragon in its natural habitat. However, once learning how far away Komodo National Park was I never thought it would be possible. Well after 20 years of dreaming I finally made it out to see them!! Located only a 1 1/2 hour flight east of Bali lies Flores Island. This stunning island is used as the base camp for a majority of all the visitors coming to see the dragons and the surrounding islands. The beauty of the area is something out of the movies. Something you just simply can’t describe to someone else. You just have to come see it for yourself. When visiting the national park there is only one place to stay. Ciao Hostel. There are breathtaking views on every level overlooking the national park. The hostel itself is brand new and very clean. 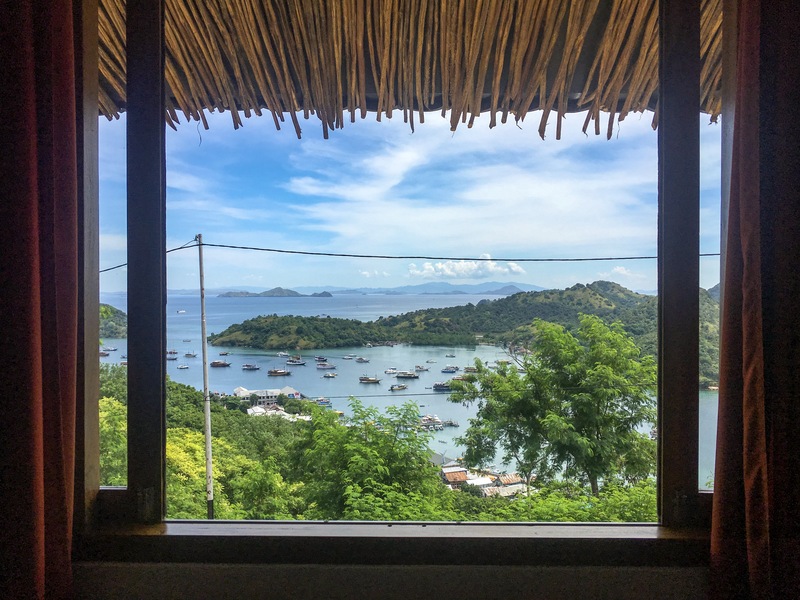 Each room that faces the water has absolutely breathtaking views and it has to be the best view I have ever seen from a hostel. While it does not offer free breakfast, it does offer free yoga on the roof top every night with panoramic views of the bay. At 9pm every night they have a movie night with bean bag chairs and everyone votes from a list of six movies on what to watch. The hostel offers day trips to visit Komodo National Park from 500,000 IDR. This is the option I decided to take. 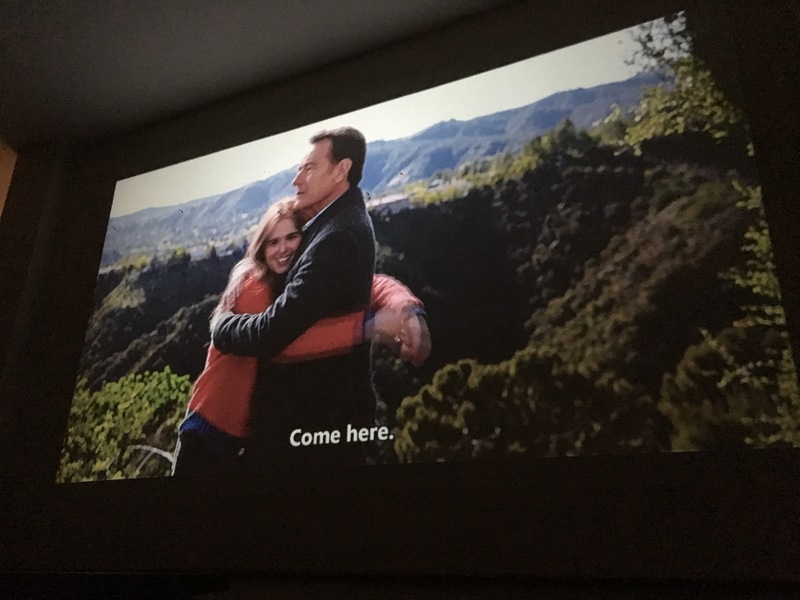 The movie is projected on the wall! The wake up is the worst part of the trip for sure…I have not woke up at 0445 since basic training and that was because I had a drill sergeant yelling in my face! Following the wake up we proceed to walk about 15 minutes down to port to board our boat. The boats usually have 10 or fewer people so it’s not over crowded. Upon boarding you cruise out to the Flores Straight at dawn. This leaves you with some spectacular views of the islands! 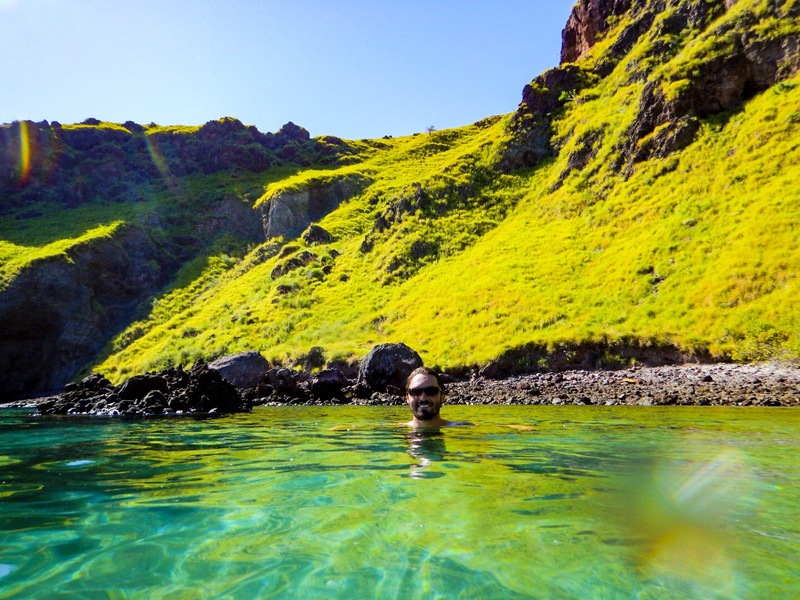 You can enjoy this for around two hours which is when you arrive at Padar Island. The boat leaves you at the small dock and you follow the steps up. Once at the top of the stairs the beaten path to the left leads you up a steep climb to the top of the island. 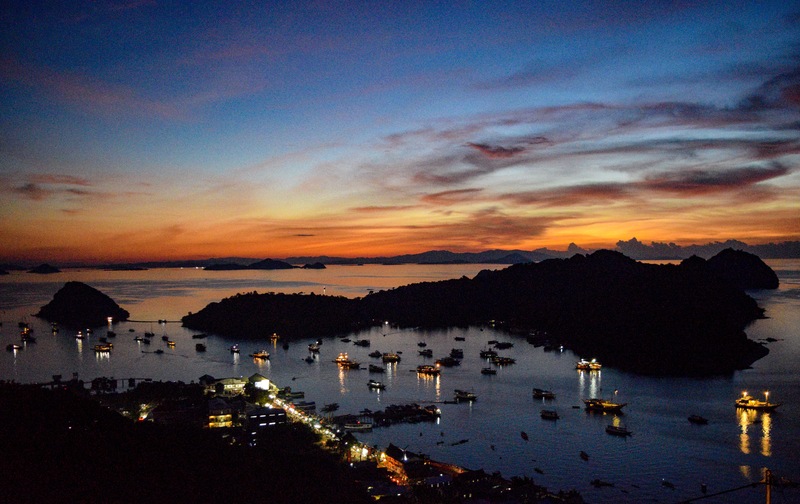 There are several false summits that provide you with spectacular views of the surrounding islands. The climb up is pretty steep but can be easily managed by scoping out the best path through the rocks. Once you make the summit be sure to stop under the shade tree just below the summit and take in the spectacular views! Pro Tip: Wait to take picture till your reach the summit and then snap them on the way down so you do not run out of time to reach the top! Pro Tip: Be sure to bring plenty of water on this trek. It is very hot out and you will need to hydrate. The views from the top of the mountain are spectacular. The whisping sea air is so fresh and the blooming spring flowers give off a clean spring aroma that is unforgettable. It is hard not to get lost in the beauty of the National Park. In every direction are amazing islands each with its own unique character. Padar island also has gorgeous butterflies that chase you up and down the trails while you take in the beautiful trekking. The journey down it can be quite dangerous so be sure to take it slow and be careful not to slip and fall while chasing the butterflies around! However, if you make it down before other people from your boat be sure to take a dip in the water to cool off! Definitely take a dip to cool off!! It was so refreshing! Next up is about an hour and a half cruise to Komodo Island. You pass around Padar Island and start heading straight for Komodo. As you get closer the size of the island comes into perspective. This Island is called home to a village of about 2500 people and around 2500-3000 Komodo Dragons. They live in harmony together and combined they help make this an UNESCO World Heritage Site and one of the 7 Wonders of Nature. Finally made it to Komodo Island!! Once in the park you are required to go check in and pay the park entrance fee. For locals it is 70,000 IDR and for Tourists it is 240,000 IDR. This price does include your guide who will take you through the jungle. I tried to go out on my own but they do not allow it. Apparently they will hunt you down and eat you. However, I’m not sure how well a stick will hold up against a 3 meter lizard! 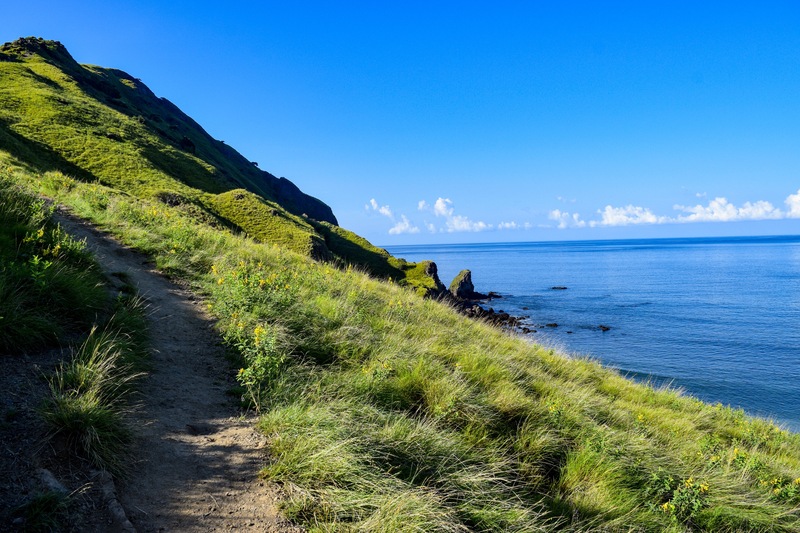 There are several trails you can take depending on how much time you have at the island. The guide usually knows where they are and take you to them since you don’t have more than an hour or two usually. Our guide just came back from the watering hole so he knew they were there still so we headed directly there. The trek through the jungle was amazing. The jungle is essentially untouched other than the defined paths made from local rocks. The shaded route made for quite the pleasurable walk to go looking for the dragons. Our guide said sometimes they will just be laying right in your path or just along it so you have to keep an eye out for them. Finally a dream come true!! 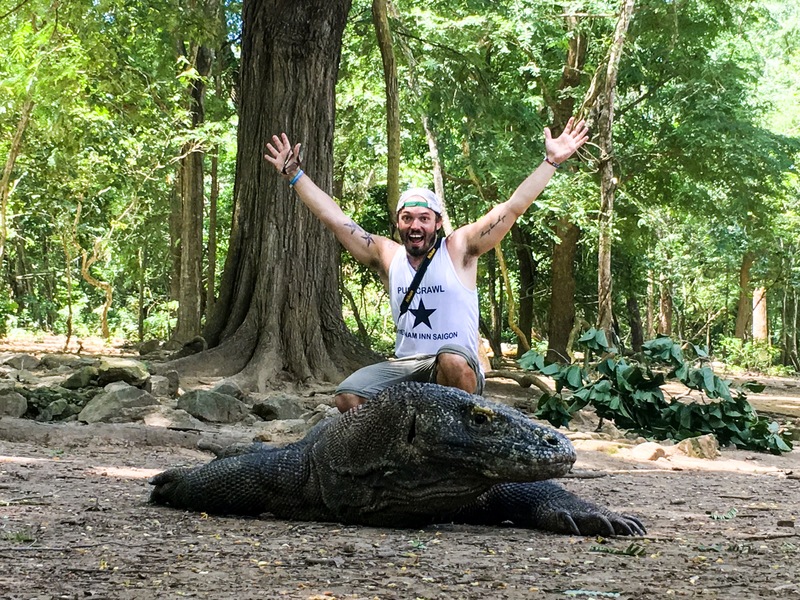 After about twenty minutes hiking through the jungle we finally came across four 3-meter komodo dragons! My life long dream had come to fruition! I have to say they were quite lazy and didn’t move much but they were still highly dangerous. They were stunning to see them in their natural habitat. The sheer size of them was intimidating especially knowing if they wanted to grab one of us they most definitely could! We were able to snap a few pics and hangout for a bit admiring them before heading back of into the jungle. On our way back a baby monitor crossed in front of us and scurried to the safety of the jungle trees where they normally hangout because until they are around 3-4 years old they are prey to the larger adult monitors. We made our way back to the docks and arrived back at our boat to head to the pink beach to go snorkeling. The current was so strong here that it was hard to stay in one place for very long. I would definitely say you need to be a strong swimmer if you don’t have fins with you if you want to go swim in the water. Our guide informed us that we should leave early to go to Manta Point to catch the tide during the slack hour. So we headed over there early to be sure to have plenty of time looking for the giant Manta Rays. Our guide did a great job at locating the Manta’s and getting us in a decent position to swim with them. Apparently the best time to find many of them is during full moon time so I lucked out because it happend to be a full moon this night. They were so deep! I’m was about twenty feet down in this pic! The rays were pretty deep while we were there and they were around 5-10 meters the whole time. I was able to swim deep enough to get close to them but the current was so intense that it took all we had to chase them down. 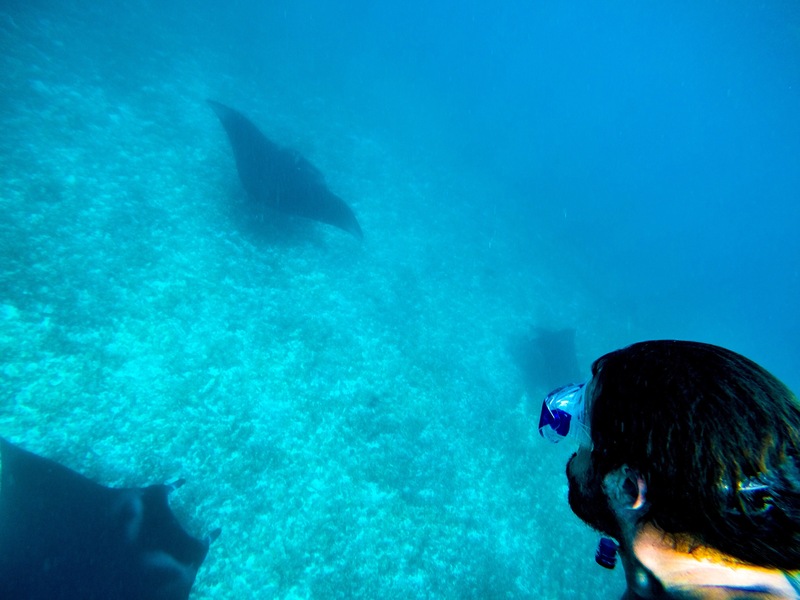 I spent around 45 minutes to an hour swimming with the Giant Manta’s. It is such a rush to swim next to these giant creatures that I didn’t even notice all the reef sharks swiming around me! Whoops! Depsite that, I would say everyone needs to do this at least once in their lifetime! Such an amazing day!! Glad to end it riding back to town on the bow of the boat!! Once we concluded our diving at Manta Point we started our two-hour drive back to port. This gave the time to really take in how lucky we are to be able to experience things like this in our lives. To be able to contemplate my impact on nature and how best we as a species can move forward and protect this beautiful planet for future generations. Sunset at ciao hostel at the end of the day! After such an amazing day exploring Komodo National Park is was just icing on the cake to experience such a beautiful sunset. I would highly recommend visiting Komodo National Park. This should be on everyone’s bucket list! I feel so fortunate that I was able to cross this off my bucket list after 20 years of dreaming about it! 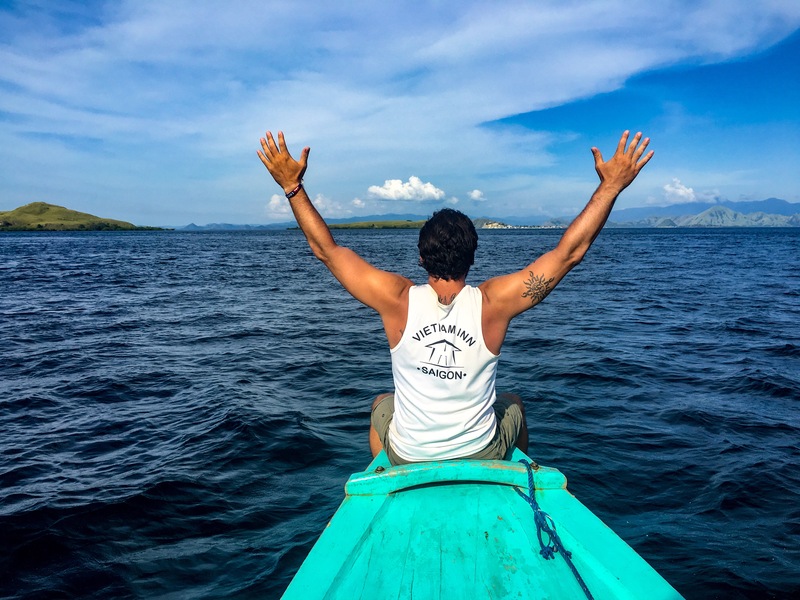 I hope this inspires you to go see Komodo National Park for yourself! If you need any gear for your adventure here check out my travel gear list to see what I brought with me! Did this article help you or do you have any questions? Leave a comment below and share with your friends!! 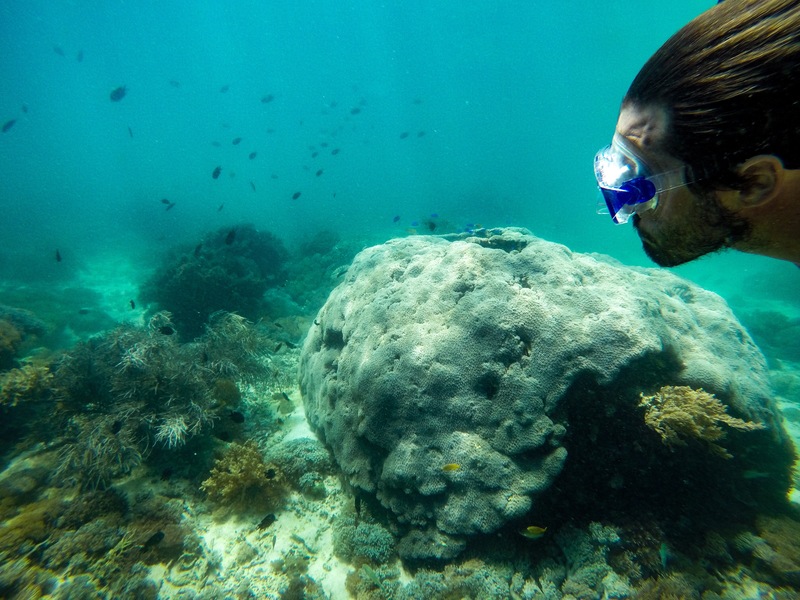 Next Next post: Snorkeling in the Gili Islands and living the Gili Life!